These instructions show you how to set up a single computer – e.g. a laptop – that will be used to hold Parts Tracker data for two separate centres. Each centre’s data are kept separate (e.g. parts, orders, stops, work done, etc) and each centre is accessed via its own icon on the computer’s desktop. Before cutting over to using two separate data files, you should set up all the common configuration that both centres will use – configuration such as parts, accounts, trouble call types, work event types, equipment types, scheduled tasks, etc. This avoids setting up these things twice after the data files have been split. 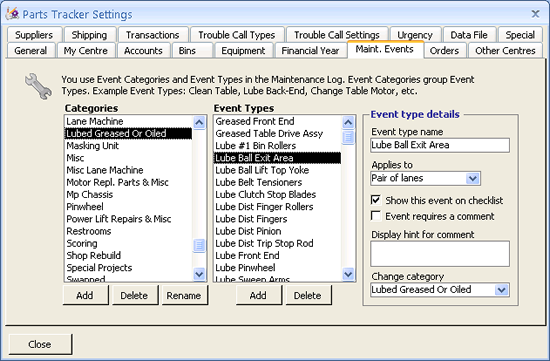 Example: Setting screen showing maintenance event categories and types. If both centres use the same data, then you only want to do this once. To do this, review the tabs in the Parts Tracker Settings screen and get as much of the common information right before splitting the files. Although you can register Parts Tracker after spitting the data files, these instructions assume you have registered Parts Tracker for the first centre already. That is, you have installed Parts Tracker, entered the details for the first centre, emailed the installation ID to Parts Tracker Support, received an unlock number back and unlocked the trial mode. Because Parts Tracker requires a separate unlock number for each centre, you will need to email a second installation ID during this procedure to unlock the second centre’s data file. Ensure you are logged into Windows as an Administrator. Certain steps will not work, or will cause errors, if you are logged into Windows as a limited user. Note: depending on your Windows settings, these files may also show the file extension on the end as “PartsTracker4.mdb”. Now you need to rename the files containing “Copy” (or “Copy of”) to something resembling your second centre (that way you know what they are). It is optional to also rename the original files, but it is easier not to. Note: notice the use of the line (underscore) before the name Greenville (_Greenville). This is recommended so as to avoid spaces in the filename. What you have just done is create a copy of the shortcut icon. Now you have TWO shortcut icons on your desktop to open Parts Tracker. Currently they both open the same program file (in a minute we will change one of them to open the duplicate program file that we created earlier for the second centre). Next, name the shortcuts accordingly. The original shortcut icon should be name after your first centre. The second shortcut icon (the copy you made in this step) should be named after your second centre. The names can be anything you like – it is simply so you know which is which! In the Target box, edit the name of the file to include the changes we made above – i.e. add “_Greenville” to the name – use the name of your centre of course. Then click OK. If you get an error, it is likely because the name of the file you’ve typed in the Target box isn’t quite right. Double-check and compare to the name of the copied file you changed earlier. Now you have two icons – one for each centre – that open two Parts Tracker program files – one for each centre. The next step is to tell the second Parts Tracker program file to work with the second centre’s data file. Small Explanation First: Parts Tracker is composed of two main files – the program file, and the data file (plus a bunch of smaller ancillary files). 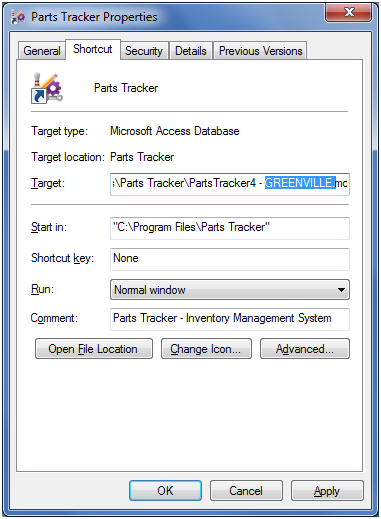 The program file contains all the logic and functionality of Parts Tracker. This is the one that is updated when a new version of Parts Tracker is installed. The data file, on the other hand, contains your centre’s data – that is, all your parts, orders, calls, work, tasks, configuration – everything you have changed or added in Parts Tracker. Open the second Parts Tracker by double-clicking the second centre’s shortcut icon on the desktop. Parts Tracker will start up. Because you have already registered the first centre (see Register Parts Tracker above), and this program file is still linked to the first centre’s data file, the trial message should not be shown. If the trial message does display, click Continue (do not register the new centre’s details yet). A question will pop up confirming you want to change – press OK.
A Browse File dialog will open up listing the four files we was earlier – including the two original files and the two duplicates we made. You need to select the data file of your second centre here – e.g. PartsTrackerData4_0_Greenville. 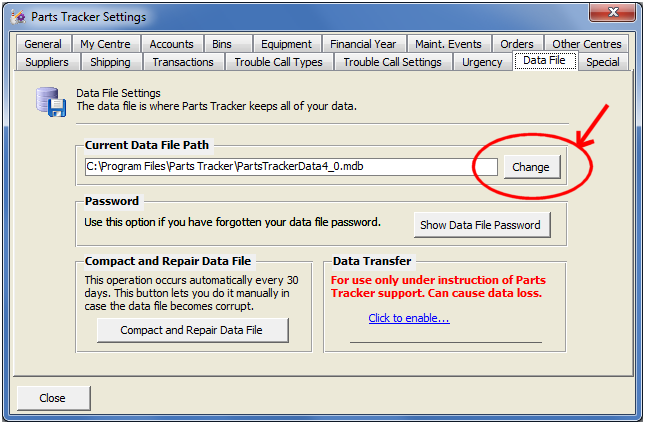 Press Open and the file will be linked to this second copy of Parts Tracker. Quit Parts Tracker and try the second centre’s shortcut icon on the desktop. When it opens, if it shows a Registration/Trial message, ignore this and press the Continue button. In the Parts Tracker Main Menu screen, again choose Settings and then choose Configure Parts Tracker Settings. In the Settings screen, choose the My Centre tab and press the Change Locked Details button. Email the blue installation ID to Parts Tracker Support to receive your matching unlock number. 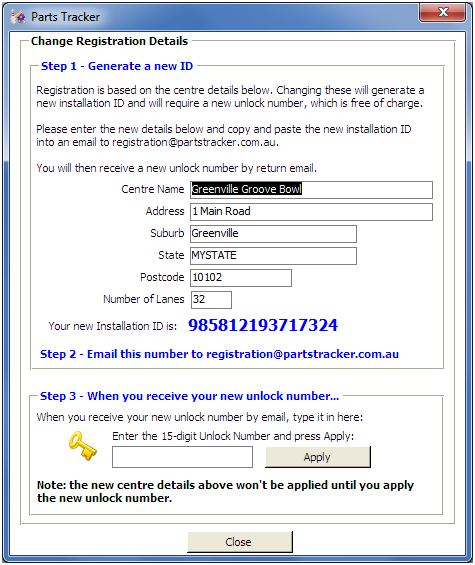 Note: Parts Tracker must be running on the same computer as a previously registered installation ID, otherwise a new licence must be purchased (Parts Tracker is licenced per-centre, except when only one computer is being used for both as is being set up in this example). Your unlock number will come via email. Note that it is sent manually, so please wait up to 24 hours depending on time zone. You can still use both centre’s files now – the second centre will run in trial mode until the unlock number is entered. If you have problems up to this point, or things aren’t behaving as described, send an email to Parts Tracker Support and describe what you are seeing (if an installation ID is generated, send it too). Once you receive your unlock number, open up the second centre. In the Parts Tracker Main Menu screen, choose Settings and then choose Configure Parts Tracker Settings. In the Settings screen, choose the My Centre tab and press the Change Locked Details button. You should see the second centre’s details and installation ID as you left it earlier. Now just enter the unlock number that Parts Tracker support sent you, and press Apply. Unless you get any error messages, you’re all set. If you do get any error messages, send an email to Parts Tracker Support and describe what you are seeing.